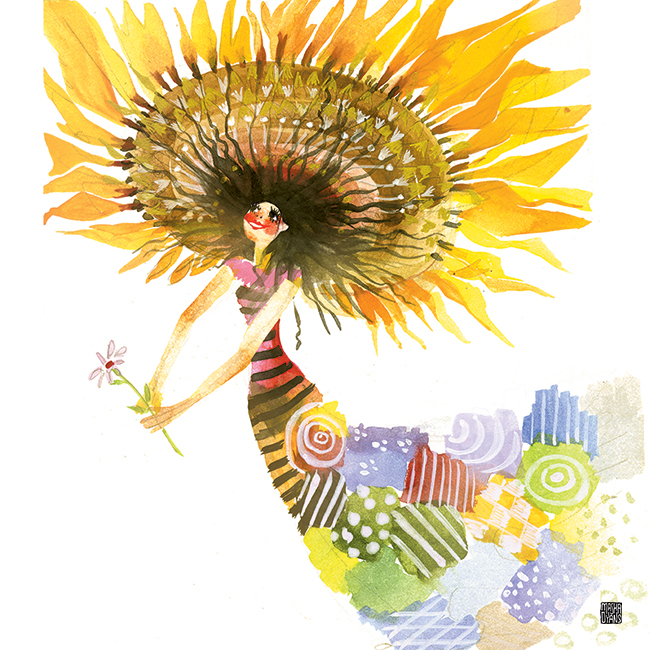 Celebrate August in all its sunny glory with a page from Masha calendar! 2019 is already out! January may be in full swing with its blustery winds and frigid nights, but here at Masha D’yans Designs, we know the warmth of Valentine’s Day is just around the bend. How comforting it is to have this gem of a holiday nestled up cozily in the coldest months of the year, providing a quick pick-me-up of connection and togetherness! 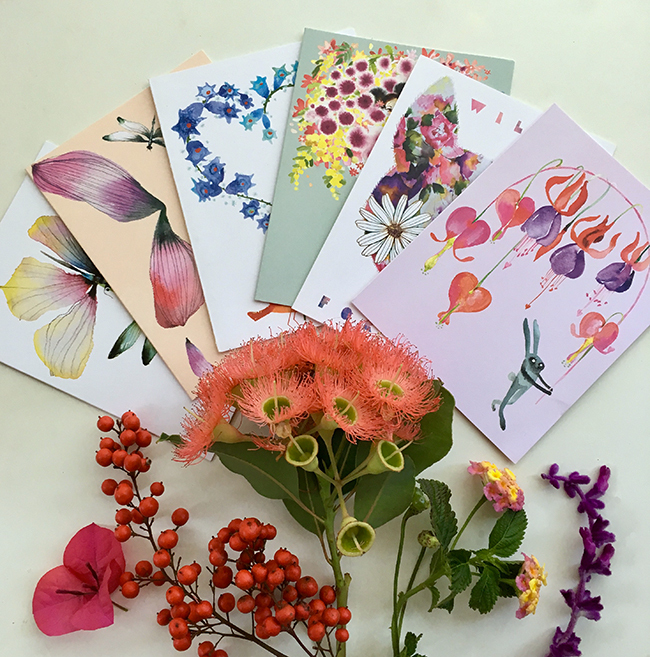 We’ve got an eye-catching bouquet of new cards on our website, many of them a lovely fit for Valentine’s Day. Take “A Rose from Bat,” for instance. Send this spunky Valentine’s Day card for a little romance with a whimsical twist, or simply let an old friend know you’d like to wish them well. 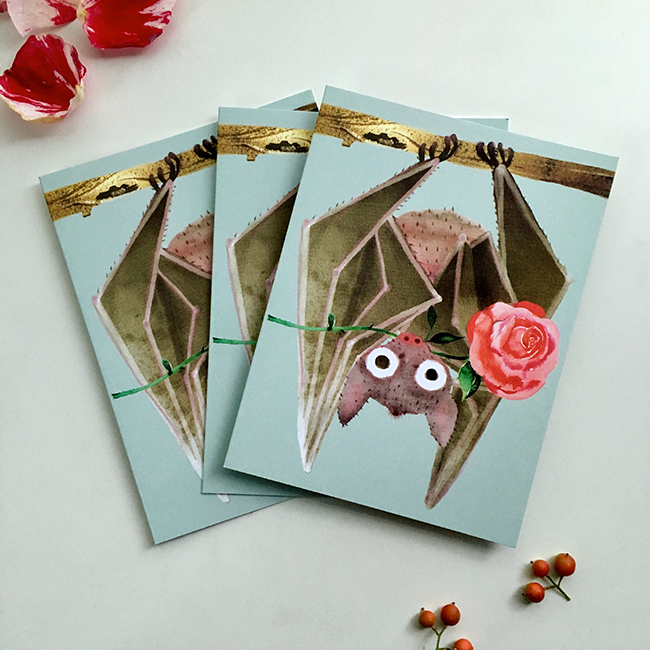 Our little bat friend is all about spreading the love, no matter the recipient. 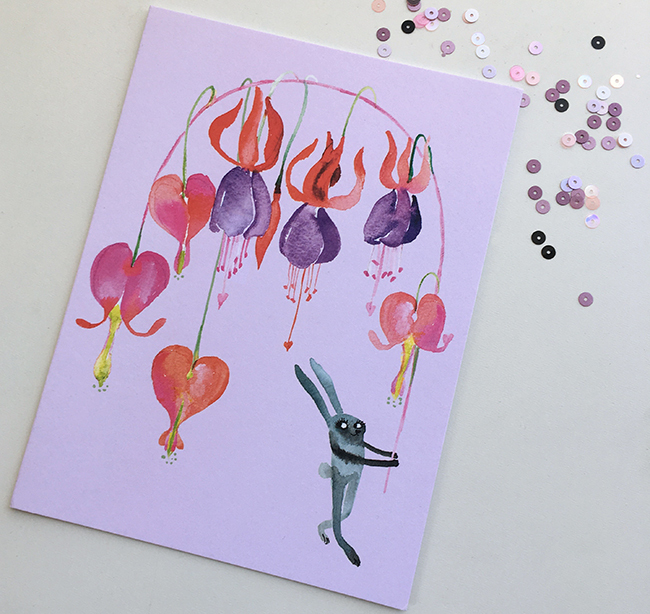 Or our “Bleeding Hearts Bunny,” combining the stunning romantic charm inherently found in nature with a little bit of magic, characteristic of Masha D’yans’ enchanting style. 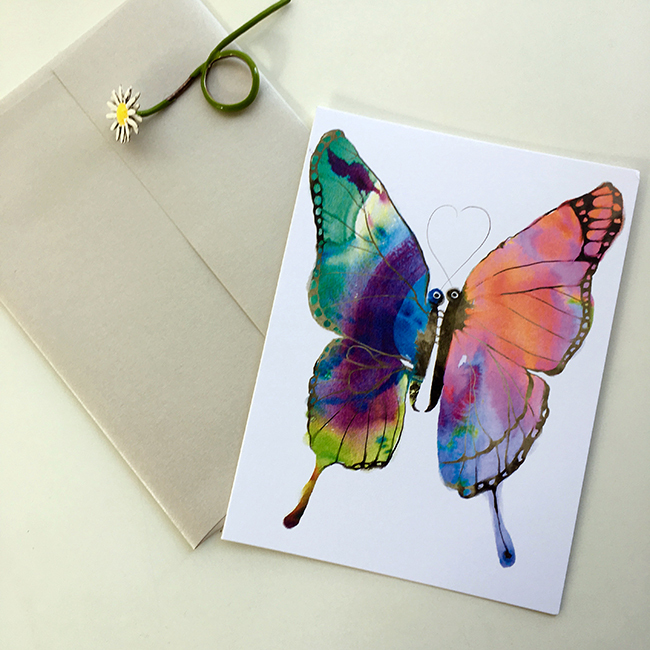 “Petals Dragonfly” is a versatile card, full of softness, and a gentle reminder of the delicate nature of love. 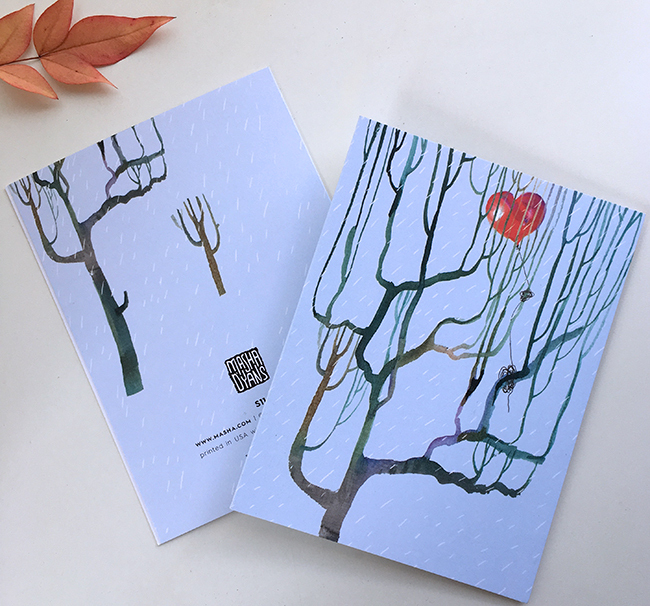 With its pastoral feel and quiet, multifaceted meaning, this card can be used for many different occasions, ranging from a Valentine’s Day note to an expression of sympathy or care. 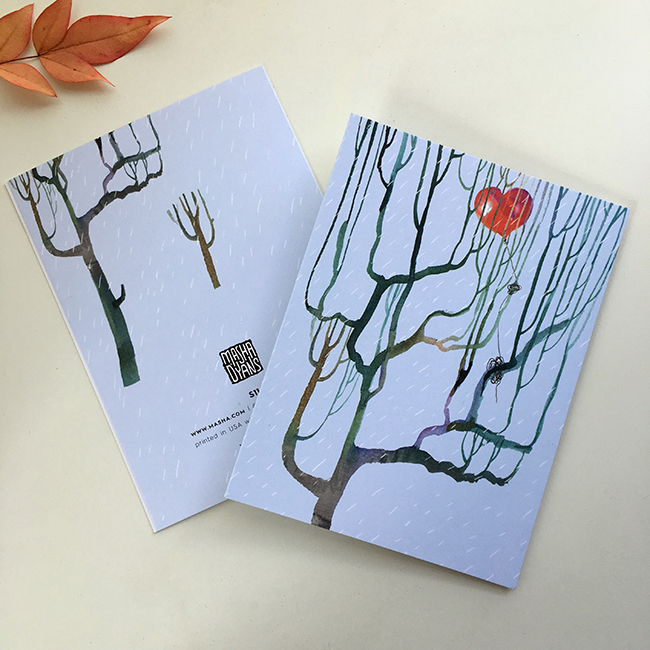 Masha’s “Heart Balloon Tree” offers a beautiful way to convey love, even in a time of loneliness or melancholy. Other new “all about the love” cards include: Hills House Red, Bouquet Outfit, Moth Party, Double Butterfly, Best Day Look, Pigeons with Balloons on Power Lines. With Valentine’s Day so near, it’s a great time to place your individual and wholesale orders so you can warm someone’s mailbox this February! We’re all about making someone’s day here at masha.com. Below we’ve collected 4 of this year’s hits created by Masha sure to surprise and delight your recipient. Let the gift giving party commence! Just don’t forget the fun holiday cards to go with them! From top down: 1. 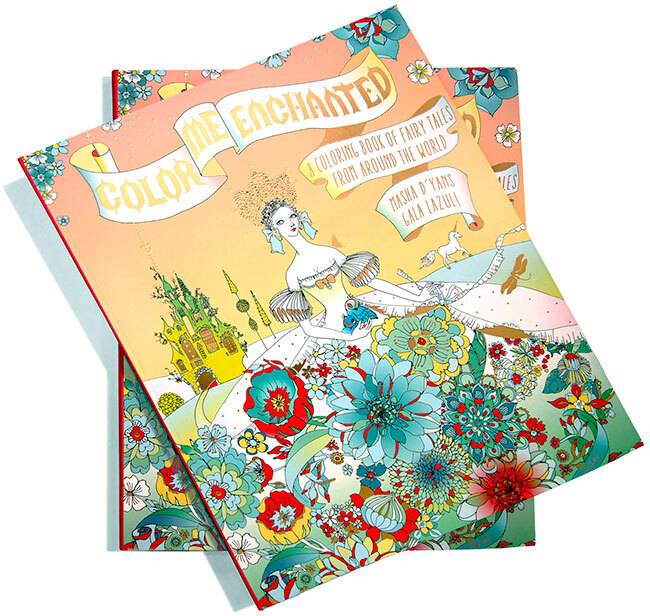 Color Me Enchanted is an intricate coloring book of fairytales from around the world from Masha D’yans and Gala Lazuli. 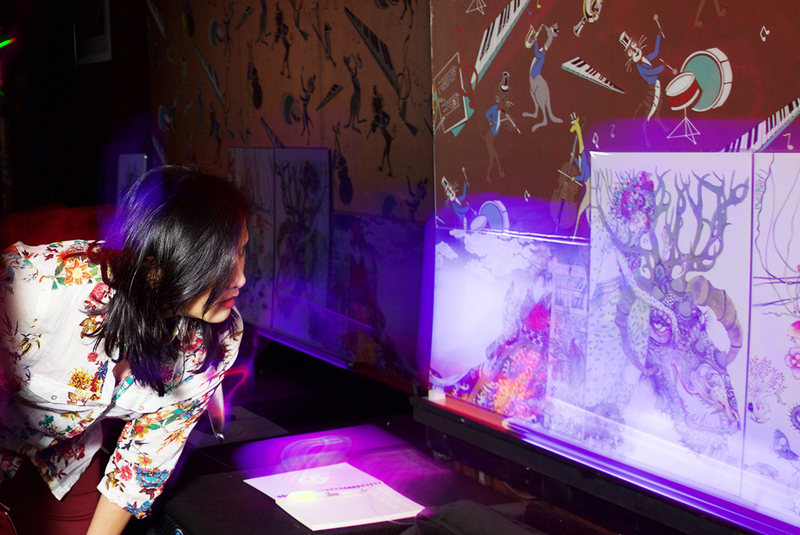 There’s over 50 artworks to color and display. Available on Amazon and wherever fine books are sold. 2. 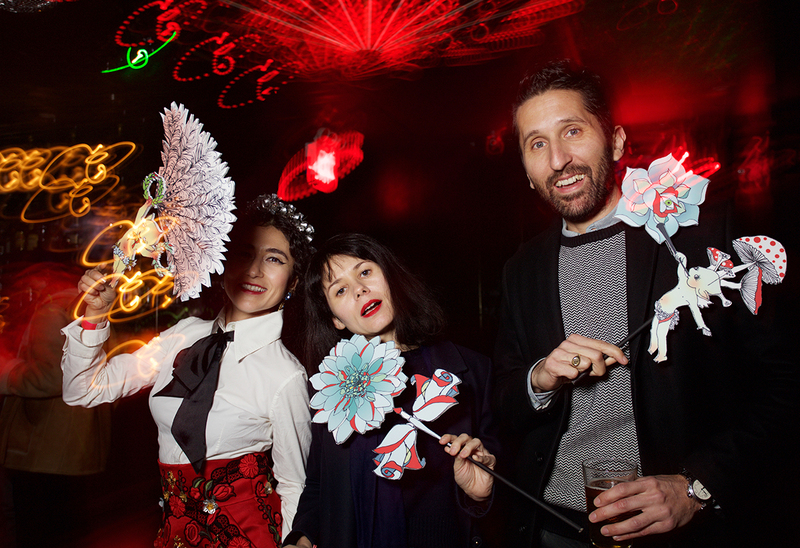 Winter Skyline is a pop-up greeting card designed by Masha for MoMA. Express your city love with fun watercolor splatters mixed with metallic ink and glitter details. Available in boxes of 8 from the MoMA store. 3. 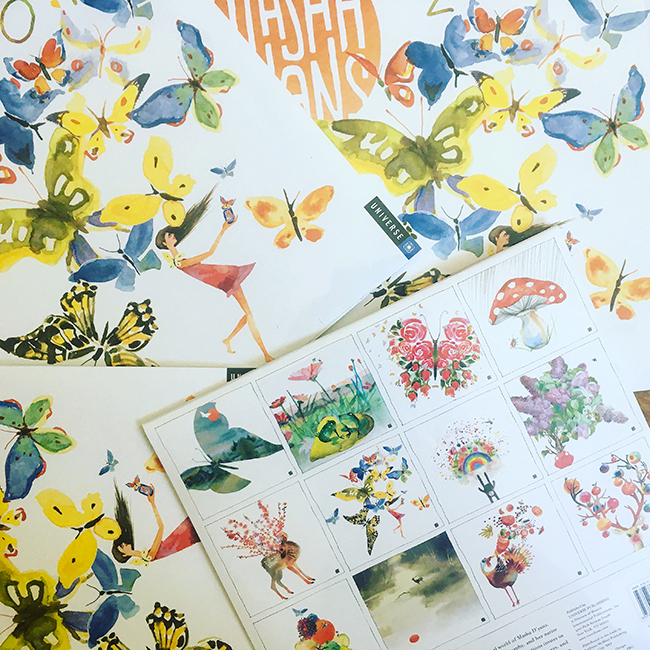 2018 Calendar collects 12 of Masha’s painting in a luscious 12×12″ format to display on any wall – a perennial best seller. Available on Amazon and wherever fine books are sold. 4. 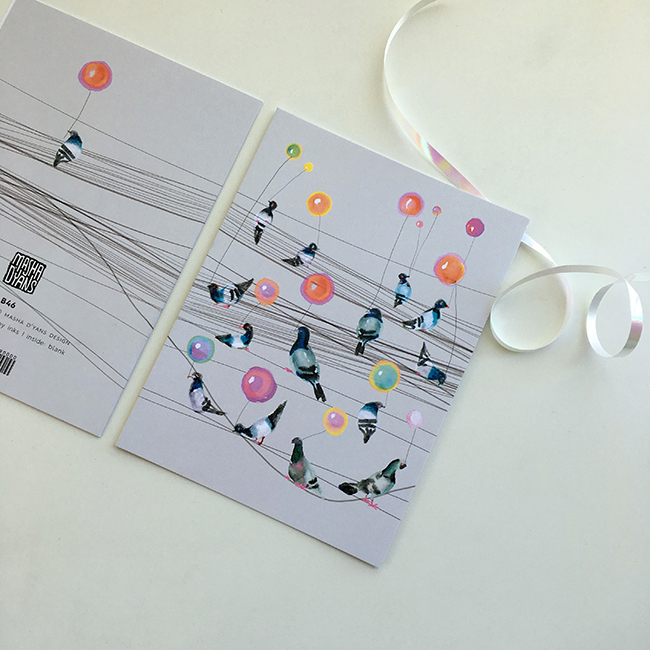 Modern Chalet is a pop-up greeting card designed by Masha for MoMA. It features neon and metallic inks for one magically cozy effect. Available in boxes of 8 from the MoMA store. 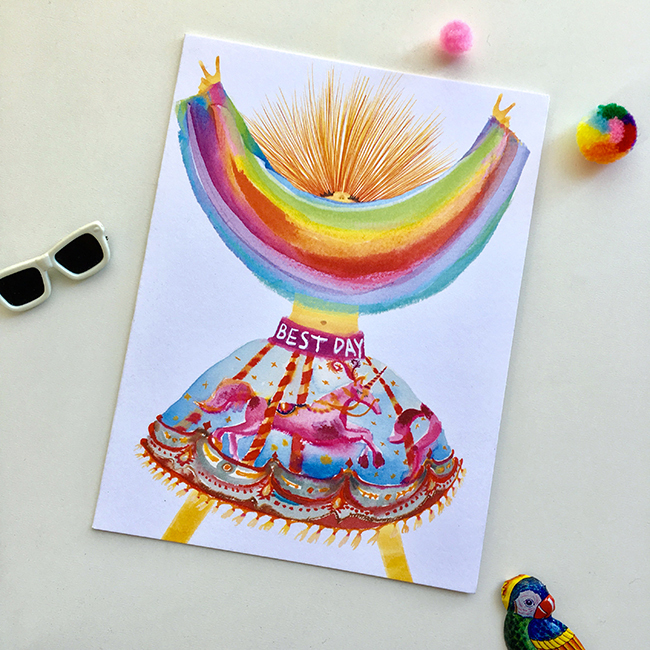 Say hello to 10 fresh greeting cards to have and to write now! 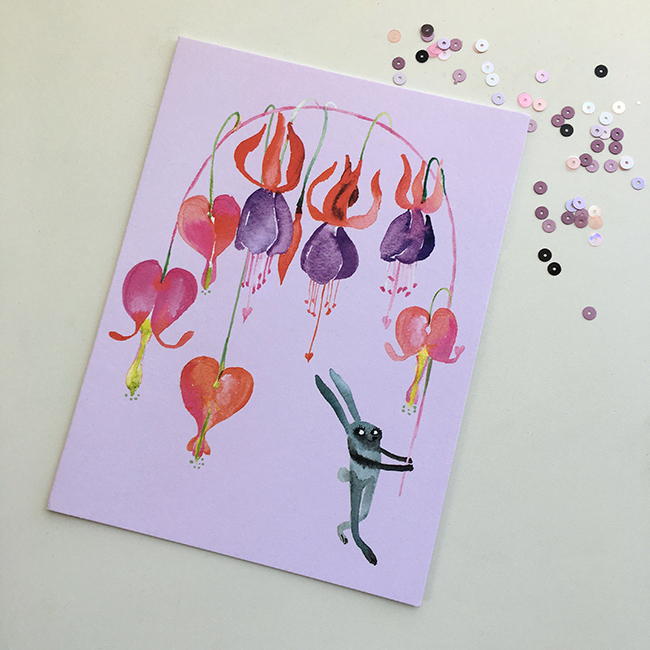 You don’t have to wait til spring to get your paws on these critters, landscapes and rainbows for all occasions. We had a blast painting them and hope you enjoy sending and giving them around for maximum fun. Scroll through all the newbies below or check them out at masha.com/shop. 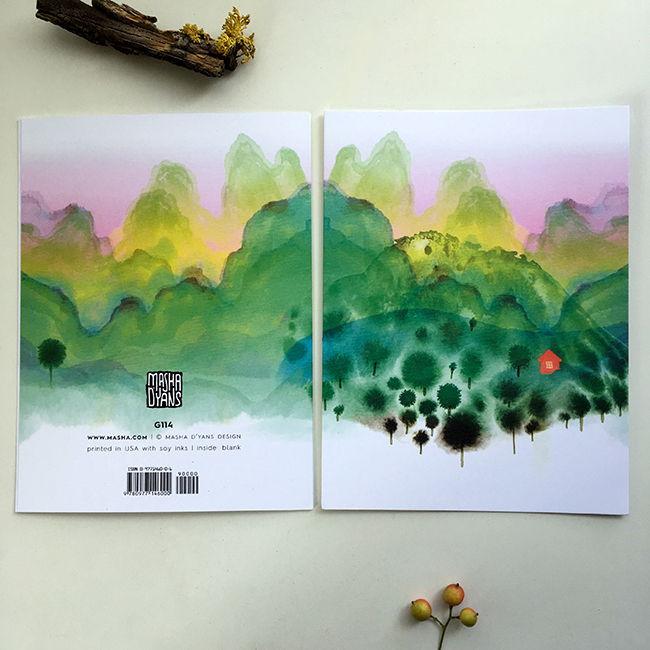 Our new calendar has been released into the world and is awaiting your lovely walls! Available now at Amazon and wherever fine wall calendars are sold. 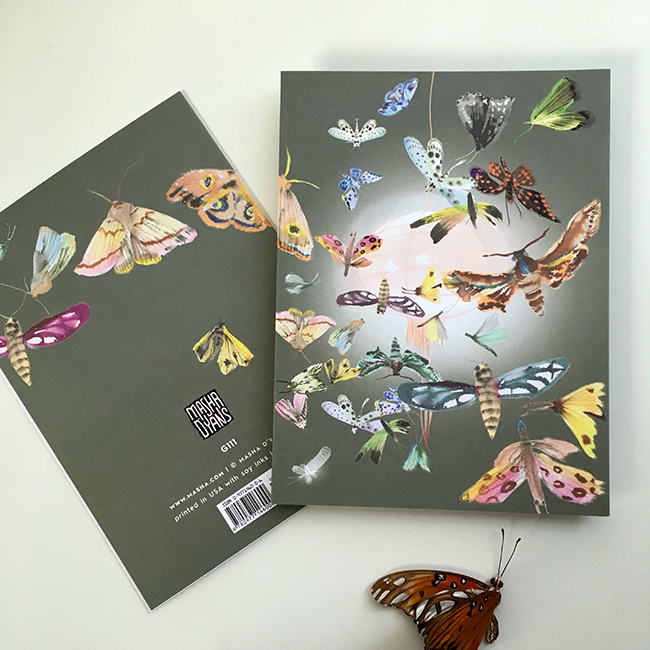 Get yours (and a few for deserving others) before they flit away like so many summer butterflies. 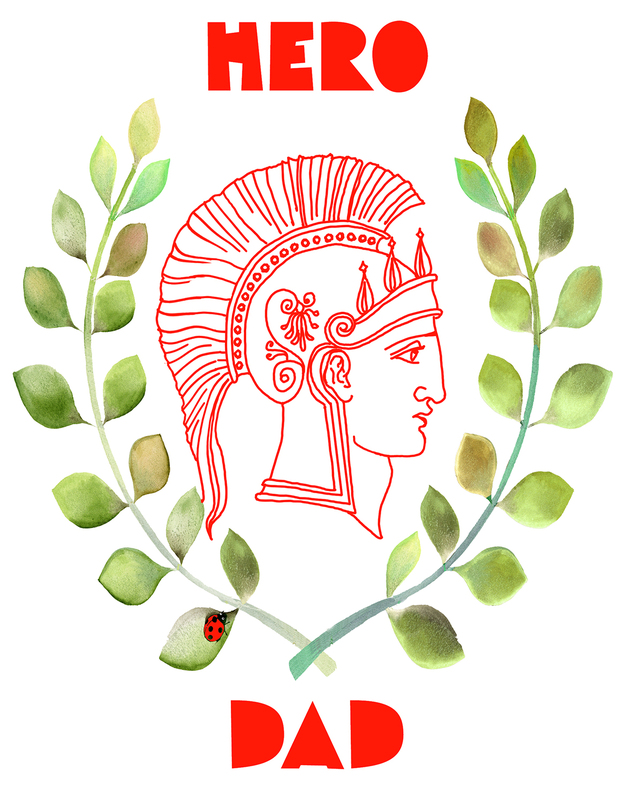 Resplendent June’s here reminding us to celebrate our favorite heroes of the father-variety! Pick a card, any card for the warrior who’s had your back, be it dad, uncle, grandpa, husband, brother, or mom or friend who played the role! They’d all love a fun token of your appreciation. Even if they’d never admit it in public. 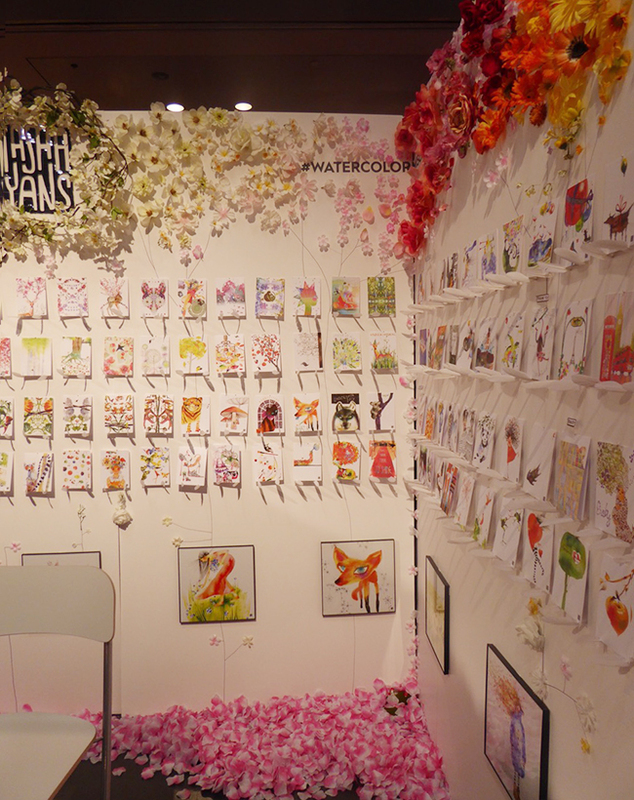 National Stationery Show, let’s go! 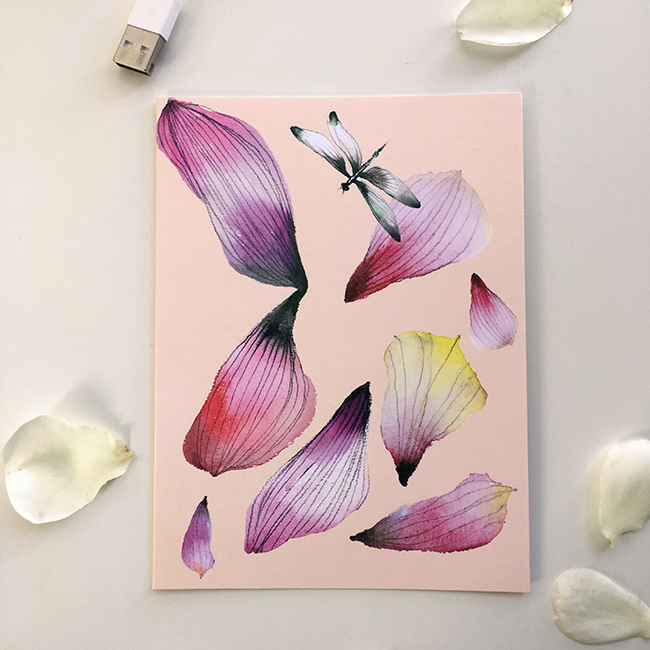 As we get ready to attend the National Stationery Show next week, we thought we’d take a walk down memory lane (strewn with plenty of fleurs, of course). Please enjoy a look back at our last show. 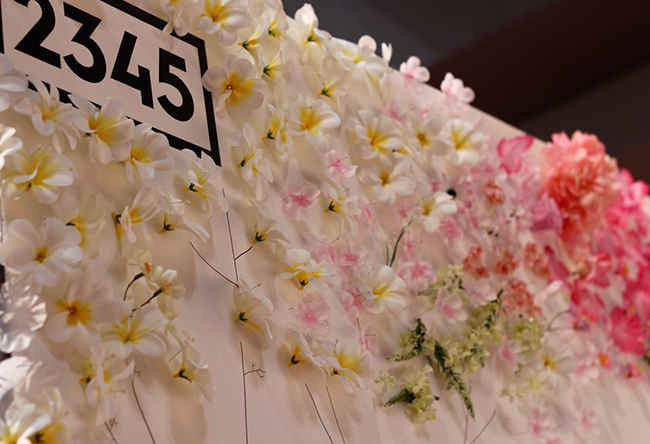 Our booth was a light construction, hand-pinned with a myriad of salvaged silk flowers collected from all over and deconstructed by Masha and her mom. 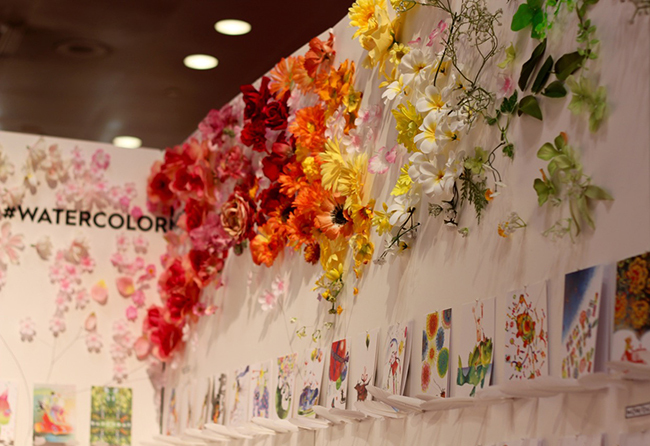 It was a real labor of love and art to compose the blooms into lush compositions of color gradations on the walls. Masha’s idea for light shelving was to use feathers to hold up the cards. Alignment was difficult to achieve by hand but everyone loved the unique effect. 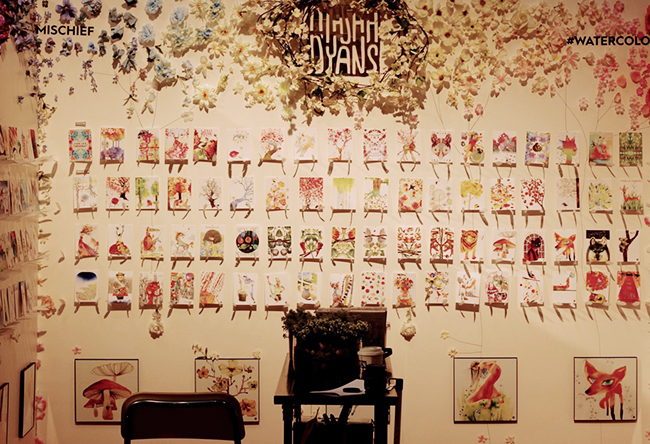 Best of all, the cards were the heaviest thing about this booth design. Silk petals served as flooring. It was a welcome zen activity to brush them back in place with a small broom after each busy day. The lighting was a bit harsh for photos, but we spotted many a fake “selfie” being taken in order to photograph our booth design OTDL. That’s a compliment, right? Let’s not forget about the fashion. 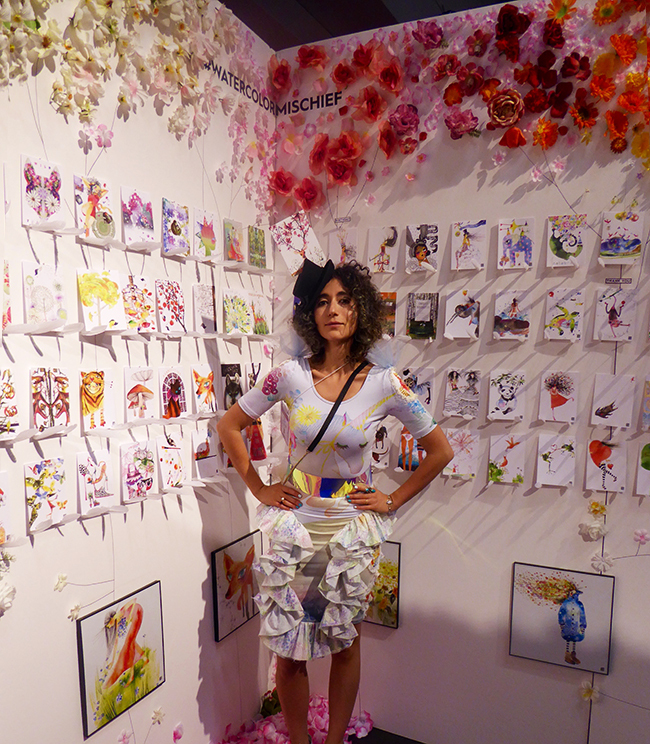 All outfits were done by Masha and her incredible mom and incorporated artwork from the cards. As well as the cards themselves (see hat). 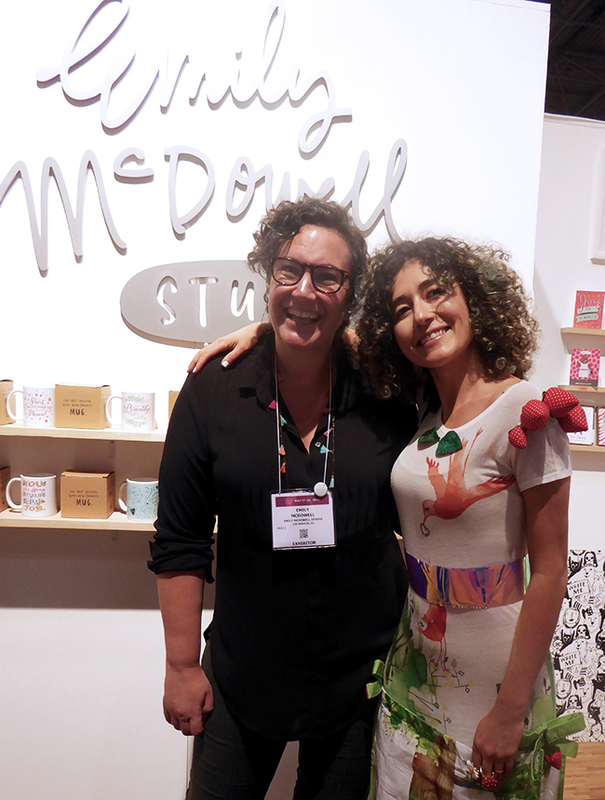 Here’s Masha with friend (and fellow curly girl) Emily McDowell enjoying the show. 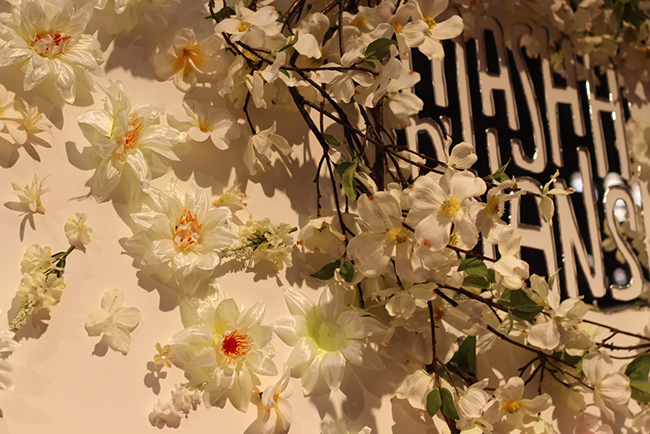 May is here with myriad of blooms in tow! 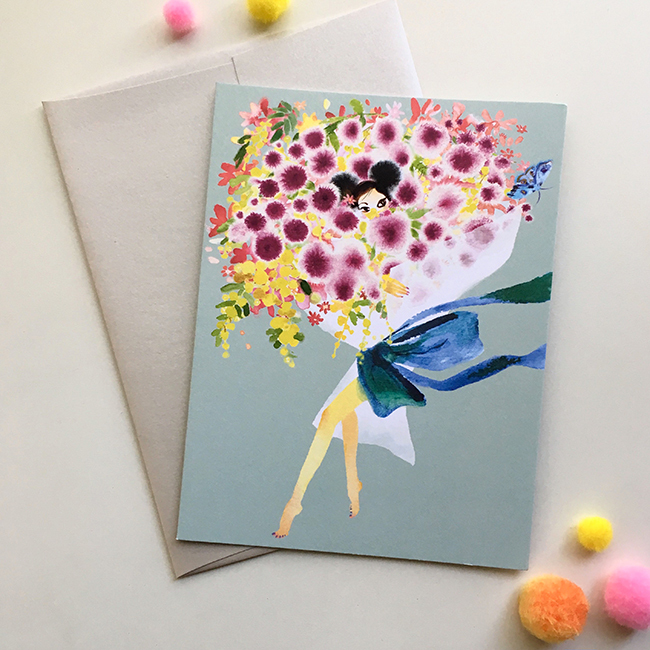 Here on masha.com, we have a few fruits (and flowers) of our labor to share too – 23 new cards to be exact. They look as good going as they do coming thanks to the lush art on the back as well as the front. Pick some for Mother’s Day and beyond! Welcome May flowers card showers. Book Launch in Manhattan Beach 2/11! If you happen to be on the west coast, please come to our book launch event at Dacha in Manhattan Beach this Saturday! Enjoy cocktails by Casamigos tequila, tipsy coloring, music by Pat Restaino and a special appearance by the mystical Sky White Tiger. Our book launch will feature an exhibit of original drawings, one-of-a-kind prints, and signed Color Me Enchanted books. These make lovely gifts for Valentine’s Day and beyond! 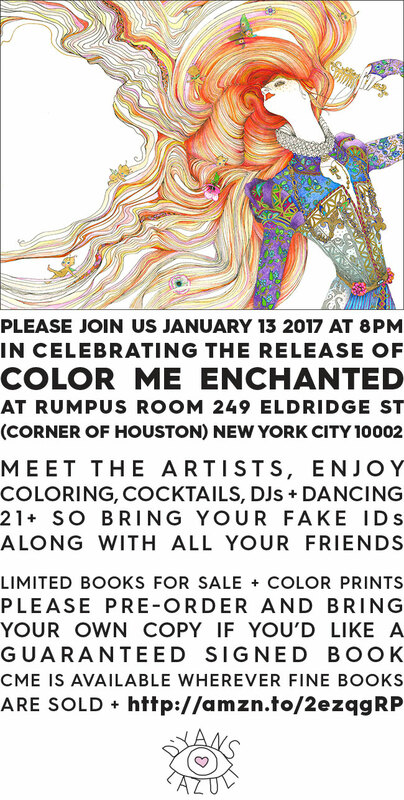 Color Me Enchanted Book Launch: February 11, 4-7 PM. 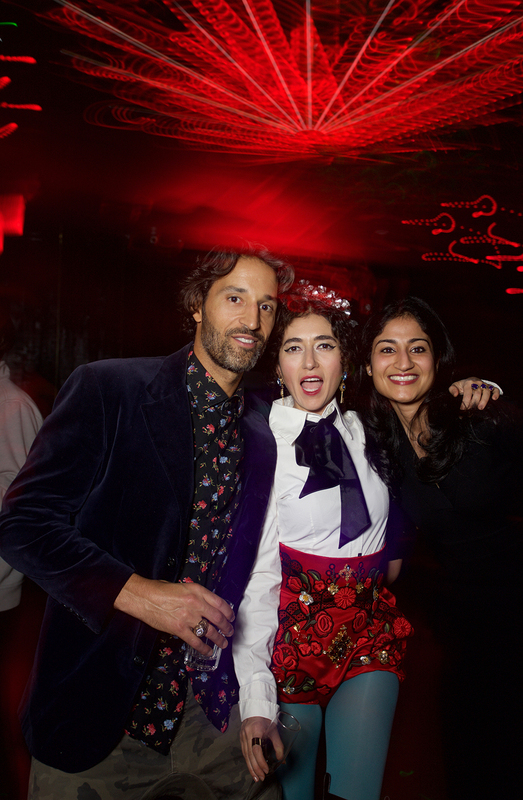 Here’s a taste from our January New York launch. welcome 2017 + new book! 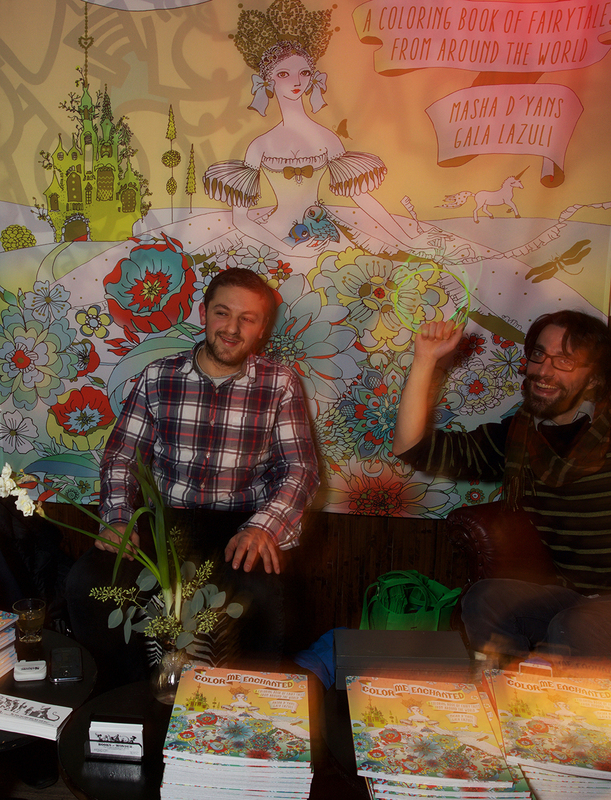 As we ring in the New Year, we’re ecstatic to also welcome our new coloring book!! 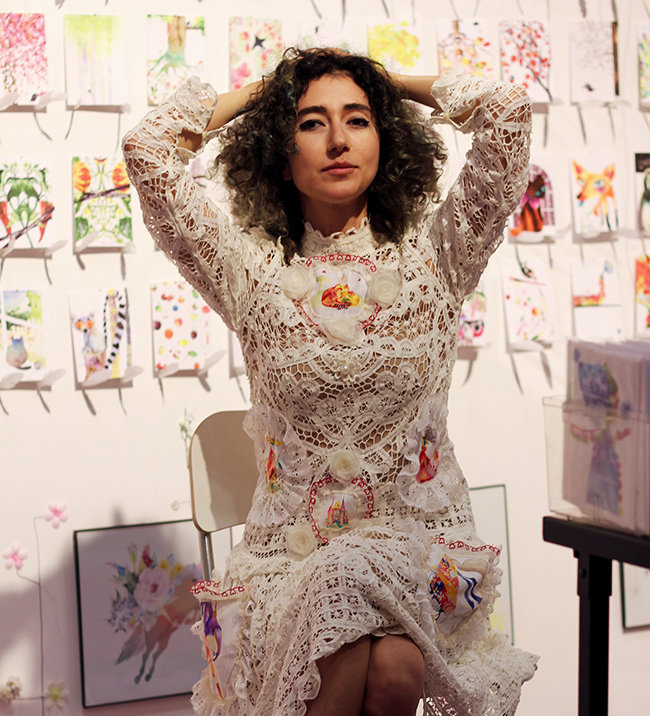 It’s taken many months of meticulous drawing and designing by Masha and Gala Lazuli, and now Color Me Enchanted is finally here! Released wherever fine books are sold, and at Amazon. If you’re in New York City, please join us in celebrating our book’s release on Friday, January 13th, at Rumpus Room 249 Eldridge St (at Houston). 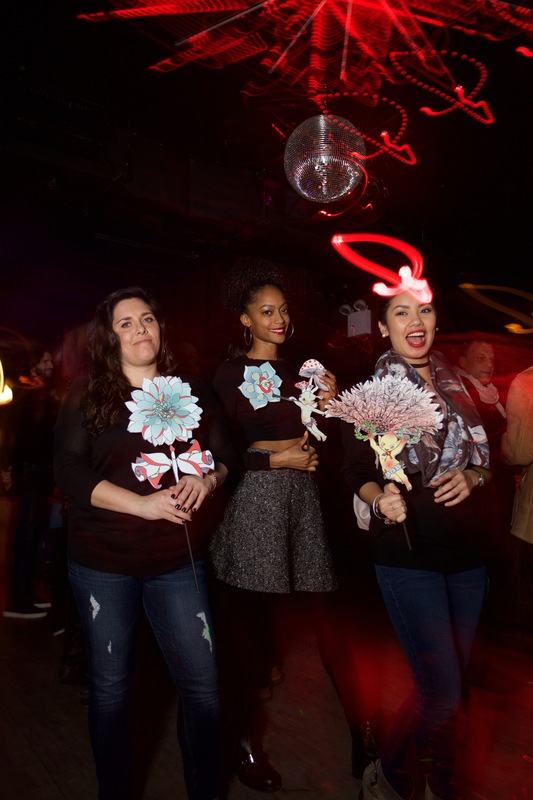 Come meet the artists and enjoy coloring, cocktails, DJs + dancing. This event is 21+ so bring your fake IDs along with all your friends! There will be a limited number of books for sale + color prints. Please pre-order and bring your own copy if you’d like a guaranteed signed book. 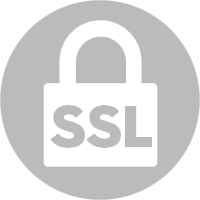 We will also have a launch event in LA in February – California legends please stay tuned! Start your new year off right by escaping into fantasy and meditation, with scenes from 25 global fairy tales to color and display. Unleash your inner artist through the sophisticated and dreamlike pages of this unique coloring book. Drawing inspiration from fairy tales told around the world, our new book lays before you whimsical, magical art filled with fair maidens, dreadful beasts, and enchanted forests. All that’s needed to bring them to life is YOU. So grab whatever medium you prefer and create something spectacular! Color Me Enchanted features more than sixty-five pages to color, perforated pages for easy removal, and as a special bonus – pages that complete a fairyland scene when put together. The final images in the book can be displayed as a grouping to make a large and charming piece of wall art. Gold foil accents on the full-color cover make it a beautiful gift for any occasion all year long! What new influences and opportunities will be headed your way in 2017? What fresh resources will you be able to draw on? How can you conspire with life to create the best possible future for yourself? These are some questions to meditate on with Color Me Enchanted. Can’t wait to see your magic colors in 2017!